RTE, the public service broadcaster of the Irish Republic, has the capacity to immensely influence the views and moral stances of the Irish nation as seasoned commentator (and one-time senior RTE insider) Eoghan Harris has often pointed out. Due to a virtual broadcasting monopoly, the way in which RTE treats contentious issues of major social concern, such as terrorism, migrant waves, the resurgence of European anti-Semitism, etc., arguably has a greater impact on the thinking of the Irish Nation than equivalent broadcasting institutions in other countries, such as the United Kingdom’s BBC, that compete with a strong private sector. RTE’s audience reach extends beyond the Irish Republic, with media saturation in Northern Ireland, and its radio and television channels are viewed quite widely abroad, particularly in the UK mainland. The controversy over Ken ‘Newt’ Livingstone’s suspension from the British Labour Party, for defending Naz Shah, an MP accused of anti-Semitism, raged in the UK last month. Livingstone was suspended for an odd apologia of Shah’s actions – he claimed that Hitler supported the Zionist movement until he “went mad” and instituted the programme of mass Jewish extermination. Livingstone has since doubled-down in his attack on the Jewish State by claiming Israel’s creation was a “catastrophe”. Livingstone’s comments were without any historical basis but he would attempt to back-up his claims with the use of bigoted ahistoric sources cited by neo-NAZI types in the shadier side of the Internet. His assertion that Israel should not have been created “because there had been a Palestinian community there for 2,000 years,” was similarly ahistorical, fitting the PLO’s old propaganda-narrative that Jesus Christ was the first Arab-Palestinian shahid (martyr). He also holds Israel responsible for the military aggression of the Arab-Islamic world, and the creation of ISIS, whilst conflating the risk of a nuclear-Iran with Israel’s arsenal. The fracas has been given little attention to-date on RTE. 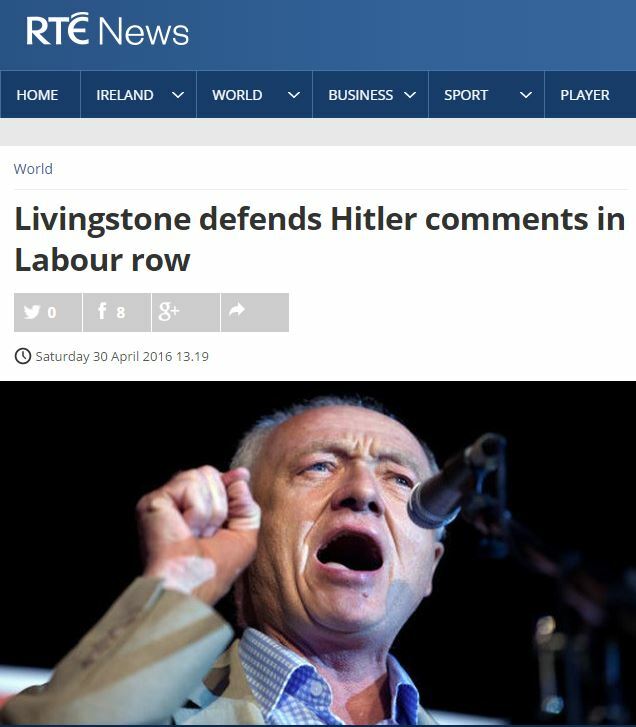 Their sole article on the topic (‘Livingstone defends Hitler comments in Labour row’, 30th April 2016) was peculiar because it only featured Livingstone’s perspective and that of his defenders. The article also included Livingstone’s obviously fallacious strawman of Benjamin Netanyahu’s comments concerning Haij Amin al Husseini’s role in the Holocaust — the Israeli prime-minister never suggested that Hitler supported Zionism. Broadcast coverage was similar. The story only featured passing mention on television, in an afternoon ‘RTE News Now’ bulletin on the April 28th, when the news of Livingstone’s suspension first emerged but was not featured in RTE’s lengthier prime news programmes later that same day. By contrast, the election of Labourite Sadiq Khan, the first Muslim mayor of London, received substantive coverage on radio and television throughout the May 6th/7th period, and featured more strongly in online content. The lack of coverage on RTE is rather peculiar. British political events tend to feature quite prolifically in RTE news schedules due to the close connections between the two States. Moreover, Livingstone is a politician of some renown in Ireland. He was the first senior British political figure to openly engage in talks with Sein Fein-IRA, and one of the very few to have advocated loudly for the Republican group’s cause. While head of the Greater London Council, he talked prolifically with the terror group during an intensive period of its London bombing campaign, for which he earned a considerable degree of notoriety — principally hatred. Livingstone also earned a lot of affection within the London-Irish community of yore by pandering to an exaggerated and unworthy victimhood. Indeed, Livingstone once charged that “What Britain did in Ireland was worse than what Hitler did to the Jews.” It is worth noting that Livingstone’s views would have also been perceived as extreme in Ireland! While many sympathised with the very poor treatment of the Catholic populace in Ulster, few would have agreed with his expressions of support for the IRA. Sein Fein only found electoral pre-eminance in Ulster after the Good-Friday Agreement, and only obtained electoral success in the Republic in more recent years. Labour’s electoral woes matter more? Perhaps RTE’s most notable input on Livingstone anti-Semitism controversy came when Marian Finucane, a veteran RTE journalist and presenter of repute in Ireland, discussed the issue in the second hour of RTE Radio One’s ‘Marian Finucane Show’ on Sunday the 1st May 2016. Enda Brady, an Irish correspondent with UK broadcaster ‘Sky News’, was invited onto the show to provide some insights into the ongoing row. However, the discussion was rather more revealing for its misleading and oddly slanted appraisal of the controversy. Read the rest of the post, here. the good news is the Irish are prospering in America; so thanks Britain for that; their loss was our gain but I do with RTE gave Israel a fair shake, they are disgracefully anti-Israel and pro-Palestinian. We are still here after all the Empires of the past evaporated. We’ve survived the attempt of that part of every generation that rose up against us thinking they would be the ones to destroy us. Even when we were scattered to the 4 corners of the Earth we weren’t really destroyed. So for Ayatollah K, he might reflect why this is the case. What has an Irish broadcaster got to do with an organisation called UK mediawatch? Different country, different passports, different currency, different prime minister and no reigning monarch at all. Many UKMW followers who live in the UK often communicate their concerns to us about the Irish media. ‘alan’ that would be an Irish broadcaster who broadcasts to the North of Ireland which is still a part of the UK. That would be an Irish broadcaster whose broadcasts can be received in parts of West Wales which is still a part of the UK. Your point is what exactly?